The Bears are trying to check another position off of their needs list for the 2018 offseason. According to Brad Biggs from the Chicago Tribune, a four-year extension worth $21.5 million guaranteed and $38 million overall is close. Leno is entering the last year of his rookie deal which he signed after being drafted in the 7th round of the 2014 NFL Draft. While Leno is getting a massive payday from his $1.8 million salary, the Bears gain a level of security at the position. Leno is not a flashy left tackle. He’s not an elite-level player. In fact, he is barely average overall and pretty bad in the run game. The Bears could certainly have done better for the price, but that could have had steep consequences. Chicago only needs to look to its NFC North rivals to see how a poor left tackle can drag an average or above average offensive line down to the bottom third of the NFL. If the Bears let Leno walk and whiff on a draft pick, their recent extension of Kyle Long simply wastes money. 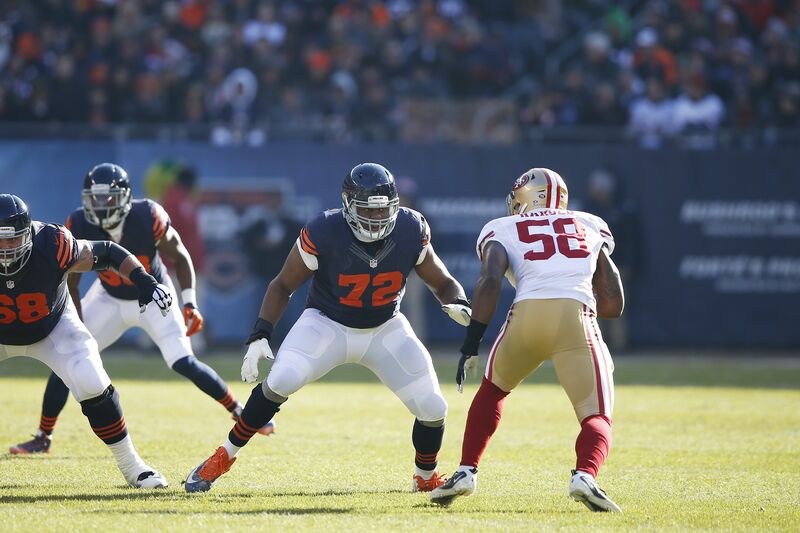 Ultimately, the Bears are going to make Leno the 14th-highest paid left tackle in the NFL. He’s making more than guys like Jason Peters, Duane Brown, and Joe Staley but less than Matt Kalil and Riley Reiff. Chicago is doing this for a couple of reasons. First, like what has been stated, they will not be able to climb out of the basement they are in without an average left tackle. Second, Leno is consistent. He was the only player on the team to play every offensive snap in 2016. Still, fans will be fans. In the replies of the tweet that announced the coming extension, the replies show many fans upset about the deal. The tweet follows so you can check out the replies for yourself. One of the reasons the fans may be upset is the team still has not signed Akiem Hicks, arguably the best player on the Bears defense. Hicks is in the last year of his contract, as well. Still, the team should be able to get that deal done. The Bears had about $20 million left in cap space for 2017 according to Over The Cap. Leno’s deal is expected to take somewhere around $9 million away from that, meaning the Bears still have $11 million worth to try to seduce their talented defensive end.